Reading about blog planning, organization and post scheduling is something I really like. It is always great to learn new tips, tricks and discoveries either from bigger or smaller/new bloggers. So, following what I love to read, I decided to write about my own tips and simple things that work for me as a part-time blogger with a crazy full time job. This will be a long post so grab a cup of tea/coffee or smoothie, sit back, read and relax. Being a nurse and having completely different shifts every week is hard work specially when you want to have a blog and take it very serious like I do. Photographing, writing and even having ideas for good blog posts takes a lot of time – time that I, sometimes, struggle to have if I don’t plan everything ahead and am not organized. One thing that has really helped me with blogging while having a full time job was having a planner. 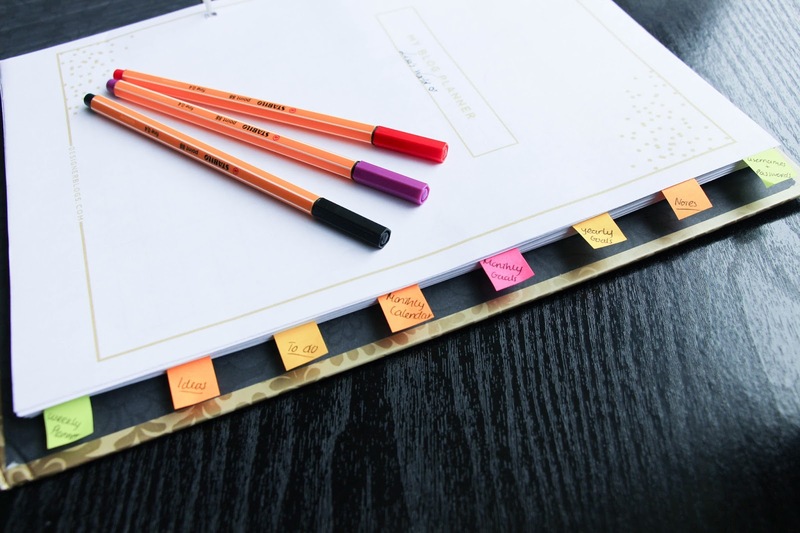 Being a new blogger, I did not want to spend a lot of money in one of those beautiful planners as I did not know if I would use it or not for a long time. While doing my google research for a good blog planner, I found the best one that I am absolutely in love and it really motivates me to blog everyday. It is perfect as it has everything you would want and much more. My blog planner is from Designer Blogs and you can get it here: Ultimate Blog Planner Kit. It has a lot of different pages (24 to be more certain) that will help you “brainstorm post ideas, plan your weekly posts, set yearly & monthly goals, track yearly & monthly stats, etc…”. It is basically the perfect blog planner for who wants to improve their blog content, scheduling, traffic, you name it.
. Username & Passwords | This is were I keep all my log in details for several websites – blog related or not (online shopping, affiliate programs, etc).
. Notes | These are basically blank pages where you can write anything! I normally have all the dates of Twitter Chats for Bloggers in the first page and if I have anything to take notes – like blogging tips or advises that I might read – here is where I would put them.
. Yearly Goals | Well this is something I never thought I would really use or even have goals to set but I do and I love it. It actually motivates me even more to be a better blogger. I only have one goal at the moment but I will be adding more as I go. There is also a section to write your strategies to reach that goal and that is also very good. Love it.
. Monthly Goals | This section goes along the same line as the Yearly Goals. 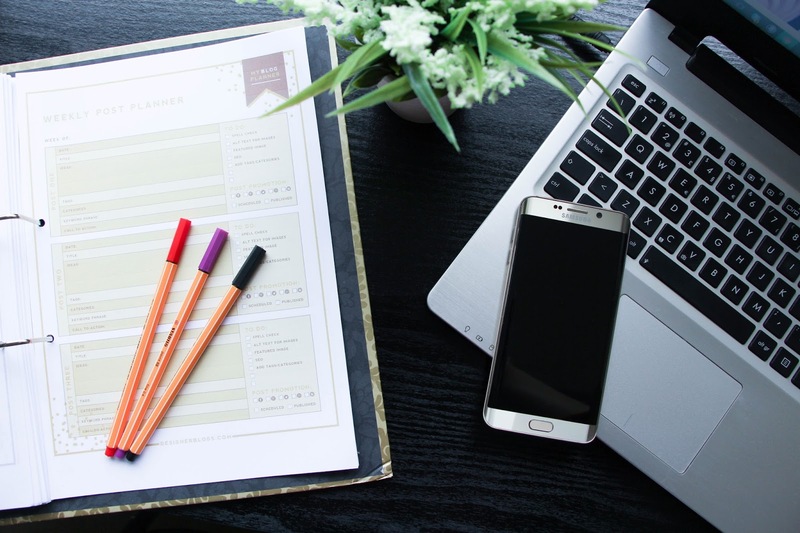 You basically set monthly goals and strategies and there is also a section to take notes of your social media traffic (that actually also exists in the yearly goals too). 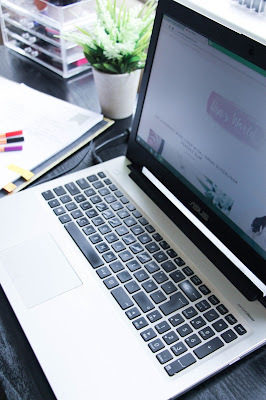 It is amazing to tick a monthly goal – I did that when I reached 40 followers on Bloglovin. That was one of my goals for this month of February. I started with 13 followers on the 23rd of January. It is now the 28th of February and I have 48 followers. Setting up a goal really helped me working for it in a much more intense way.
. Post Topic Brainstorming | I have always had notebooks where I would write blog ideas but then I would just not use it because I would write anything there and it was just too confusing. With this section of this blog planner, I can divide my ideas into subjects: beauty, lifestyle and fashion and this just keeps everything more organized and also when I plan my posts, I make sure I keep rotating between the three.
. 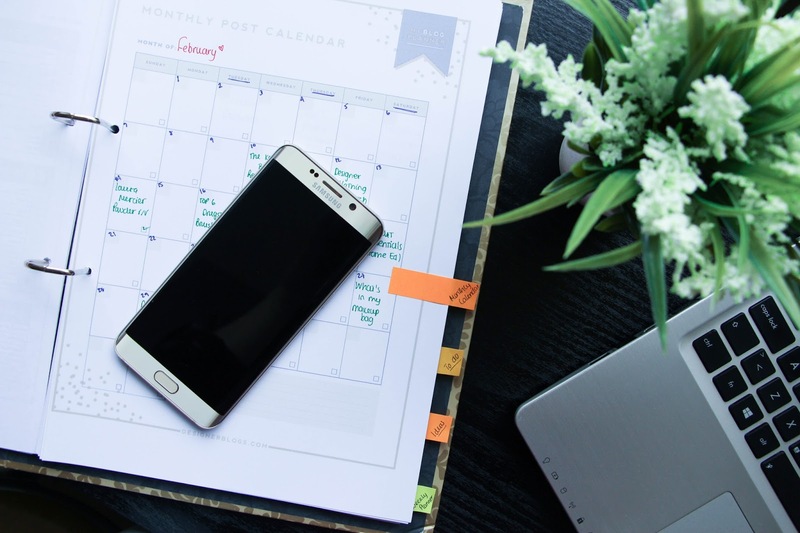 Monthly Blog Calendar | Here is where I write all my monthly posts. Basically it is just the title of the post and once it is published, I tick it (as seen on the photo above). I publish every Tuesday, Thursday and Saturday and if I can, there is always an extra post on Sunday (like this one). Again, this helps me maintaining a regular post schedule and I love that.
. Weekly Planner | Uhhh, I love this bit. It completely has changed the way I write and plan my posts. I don’t forget a thing – tags, SEO, links, spell check, post promotion, everything (see photo below). It has space for three posts although you can really just add another page if you write more than three times per week. So this is my blog planner and it is my big secret for being so organized and blog as a full time nurse. Every idea and task is there and that is what makes everything run so smoothly. Now, talking about how I do things and the order I do them, there is no big secret or trick. I normally plan ahead my ideas of posts for the week – I already have my posts planed for the week ahead (basically, just the titles and nothing else). Now what I do is, on my next day off I photograph everything I have to and also edit them straight away. To edit my photos I use Adobe Photoshop Lightroom (I can do a more detailed post about that if you want to). After that, I start writing the posts when I have more time. Again, when I have days off, I basically work all day on my blog but I can never write all the three/four posts of the week in only one day. I just see when I am working at the hospital and according to my days off I plan when to write my posts. When all of this is done, I schedule the post for the according day, at 9:30 am and that is all the hard work done. Something that I also do everyday at night, is reading and commenting the blogs I follow or any new blogs. I love doing that! Looking at final result of my post is so rewarding and enthusiastic! Publishing a post is more than just writing a few lines. Creating a new post takes a lot, I mean a LOT, of work and commitment. Blogging is not as easy has everyone thinks so if you want to take this seriously, you need to put your heart and soul into it. I hope you really like this post and that it helps you in some way. Blogging is really a passion to me and I am working hard on improving day by day. It is a lot of work but if you really want and are passionate about it, you can do it for sure! Don’t forget to follow me on my social media for moral support and also to keep up with all my new posts! Just click on my social media icons and feel free to follow. 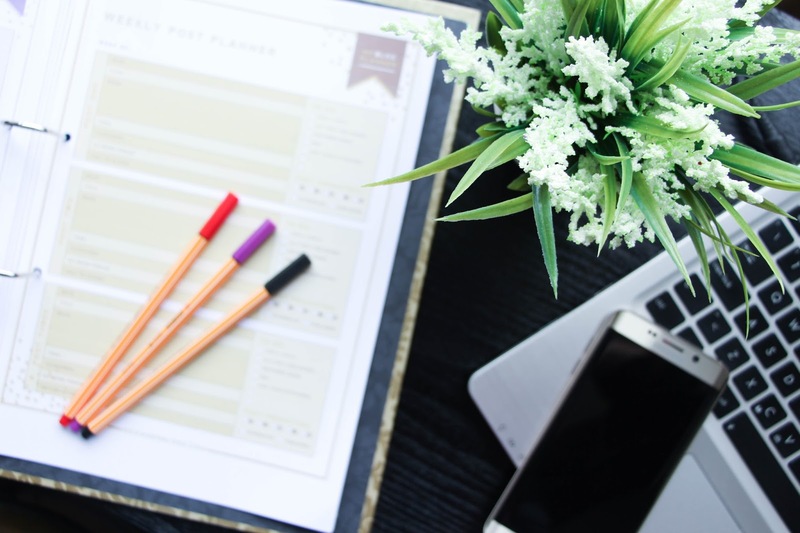 Go ahead and download the blog planner, I am sure it will help you as much as it helps me!